The idea of a soak in the tub with candles and the works appeals to me so much in theory, but in practice a hot shower almost always wins out. I’m freezing cold most of the time, and when jumper layering isn’t quite cutting it, I’m guaranteed that a hot shower always will. Then there’s the efficiency of the whole thing. I can put dinner in the oven after the gym and be exfoliated and moisturised with clean hair by the time it’s ready. I’m a firm believer that lovely beauty bits shouldn’t be reserved for those on team bathtub though, and there are plenty of gorgeously decadent beauty products designed to work their magic in the shower. I’m a big fan of double performers, so the likes of in-shower oils that moisturise and lather up, or body moisturisers that develop a hint of a tan are right up my street. H&M Shower Oil is one of my favorite things right now (€5.99, H&M). This miraculous little oil is so nourishing with the most gorgeous scent, but still magically foams up when lathered with water. The combination of soybean oil and castor oil is the loveliest drink for thirsty skin, and was my après-beach essential on honeymoon. Be warned though, the scent & packaging combo falls into the unisex category and mine is disappearing suspiciously fast…! I recently rediscovered TIGI Honey & Oatmeal hair mask (€17.95 available from Cloud10 Beauty). This stuff is the business for dry or damaged hair. My first ever in-salon purchase many moons ago, the oatmeal & honey fragrance takes me right back to being sixteen again! The packaging may have changed over the years, but the product remains as brilliant as I remember it to be, leaving hair much softer with a lovely shine. I use this all the time as a regular conditioner as well as a leave-in treatment. Since reintroducing my hair to the honey & oatmeal goodness I can notice an definite improvement in the condition of my locks. I work it through my hair with a wide tooth Babyliss shower-comb to get all that detangling out of the way. When it comes to exfoliating I’m nothing short of lazy, which when tan is wearing off can leave that marbled effect we all love. 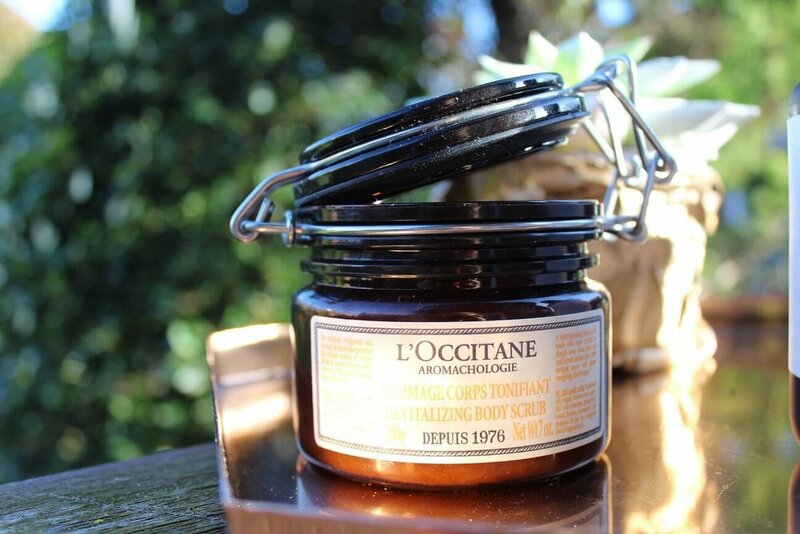 This all changed on getting to try out L’Occitane Aromachologie Revitalizing Scrub a little while ago (€31.50, L’Occitane stores). The addictive fragrance is incentive enough to get scrubbing. Laced with 100% natural Rosemary & Lavender essential oils and raw sugar crystals, this smells like a proper spa treatment and comes in the most gorgeous apothecary style brown glass jar, which I’m a sucker for. I adore this scrub and the massage oil is well worth trying out too. Are you on team shower or team bathtub?